With the start of the school year comes the flurry of science fair projects. While my kids are too little to participate, my daughter is enamored with science and knows I love it too. She even bought me a kitchen science kit for Christmas (I guess you could say she knows me pretty well!). Needless to say, we try to do fun experiments at home as time permits. One of the typical at-home science experiments I have wanted to do is the density demonstration, like this density tower done by Steve Spangler. The only trick is that I wanted to make a completely edible version that tastes good but didn’t involve alcohol (think the colorful, layered party drinks) since I wanted to keep it a teachable moment for my kiddos. This has meant a bit of tinkering in my kitchen. In the end, I ended up with the Banana Split Layer Drink. The least dense layer for most other density towers is alcohol. Here, I have replaced it with a pureed banana layer. Why does this work? First, I mixed the banana with a bit of water which is the least dense fluid out of my ingredients. Second, by mixing the banana with the water using an immersion blender traps air into the mixture, resulting in a lighter than water fluid. 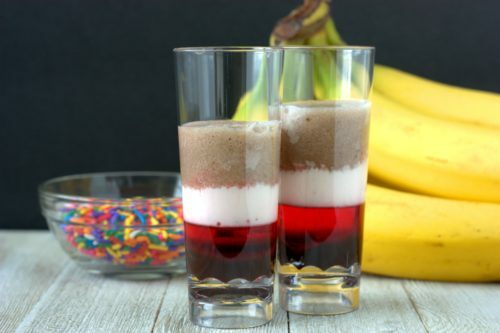 The full banana split density tower is layered as follows: a chocolate syrup layer gets topped with grenadine, half and half, and pureed banana. Each layer has to be poured slowly and carefully, preferably with a turkey baster. When consumed, the Banana Split Layer Drink does taste like a melted ice cream sundae. Who knew that a density science experiment could taste so good? In a tall cup, blend the banana and water with an immersion blender until smooth and foamy. Pour the chocolate into the bottom of a tall, skinny glass. 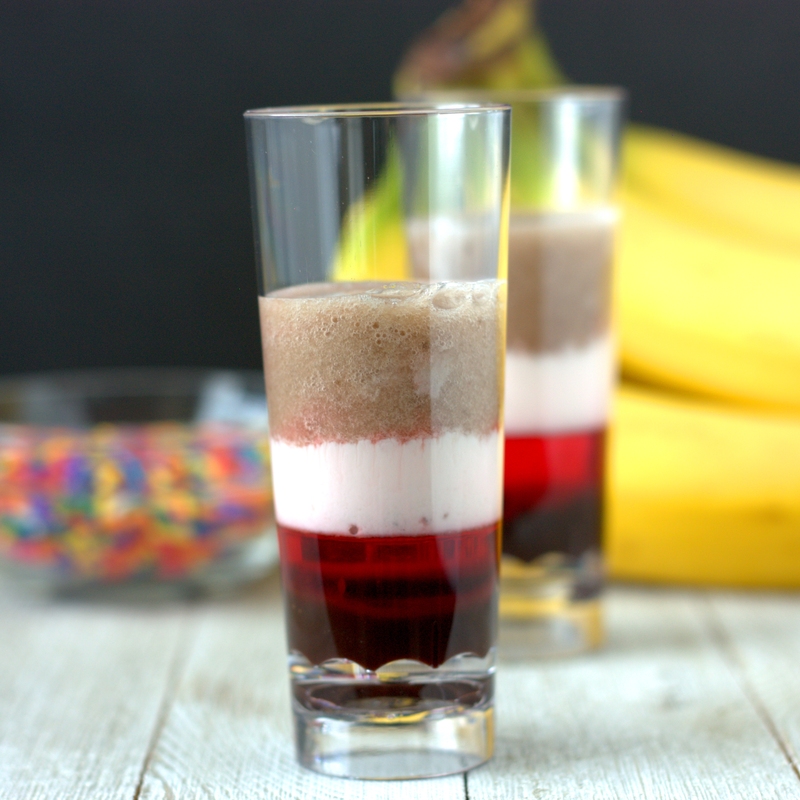 Pour on a layer of grenadine, and then using a turkey baster carefully pour on the banana layer. Clean the baster and then carefully pour on the half and half layer. Note: While the banana layer is less dense and would seem to be the last layer to add, a cleaner separation occurs when the pour order of the half and half and banana layers are done in the order described above. 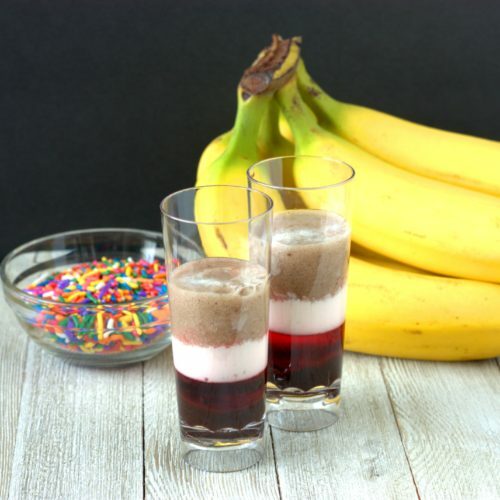 This entry was posted in Beverage, Food Science and tagged banana, density, experiment. That is so pretty! My kids would love it for breakfast! When I was homeschooling I did a lot of this type of thing, too. It’s a fun way to learn.